As hopefully everybody knows by now, I'm proud to be obsessed with cats in horror movies rather than filthy, stinking dogs. 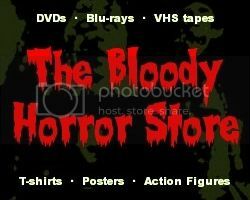 Let's face it, the internet is virtually made of cats, most horror fans are owned by cats, and felines crop up in far more horror movies than their canine counterparts. Having worked for an SPCA (where I fed, watered, cleaned, and walked hundreds of abandoned dogs round and round in circles every day for over a year), I might not particularly like dogs, but I'd never be cruel to any of the dumb, gluttonous creatures. Still, as far as I'm concerned, dogs are no better than farm animals and should be kept outside. Dog owners' houses always reek even worse than if they had small children or kept pigs inside. Ugh! Then there's the constant drooling, begging for attention, food, and exercise... and that's usually from the owner's themselves. 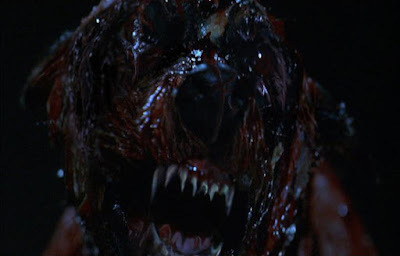 If you ever needed a reason not to have a dog, here's a quick top ten list of the nastiest dogs in horror. 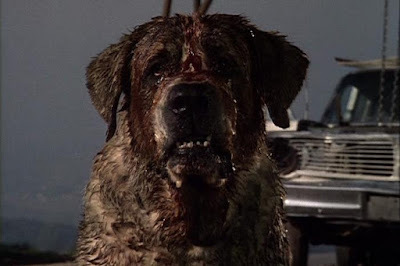 In easily the most famous horror movie featuring a dog, a once friendly St. Bernard named Cujo contracts rabies and traps Donna Trenton (Dee Wallace) and her son in their car. He can't help it, he's sick. 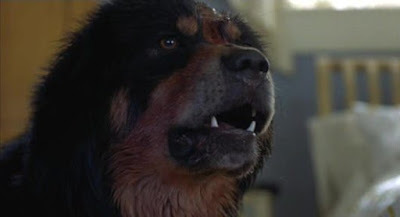 Max, a genetically-mutated Tibetan Mastiff, escapes from the laboratory which created him. He soon changes from being an intelligent and lovable pet into a ferocious weapon of mass destruction who kills anything in his path. 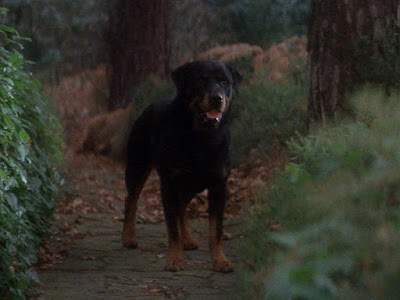 Provided as a canine protector for antichrist Damien Thorn (Harvey Stephens), who is himself born of a jackal, this Rottweiler certainly looks and acts the part. An innkeeper's dog saves a woman from being bitten by a bat which is, in fact, Count Dracula in disguise. Angry at losing his meal, Dracula bites the woman's saviour and turns Zoltan into a bloodthirsty vampire. 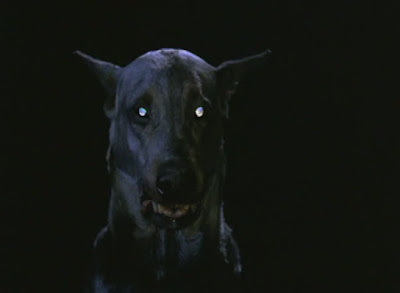 What could be scarier than a mutated Doberman Pinscher? Seven mutated Doberman Pinschers, of course. Fortunately, Alice (Milla Jovovich) takes care of all of them. 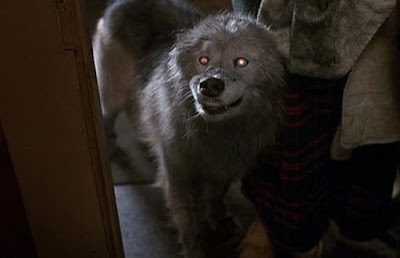 Having been shot and killed by his owner's sadistic step-father (Clancy Brown), it's not long before Zowie comes back "wrong". 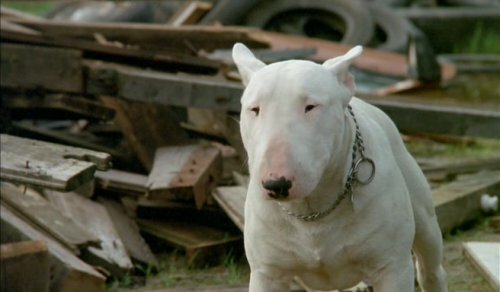 In this bleak French comedy-horror, a disturbed Bull Terrier named Baxter develops aggressive and murderous behaviour in his attempt to be adopted by another family. After being exposed to experimental pheromones, a pack of dogs goes on a bloody killing spree in a small Californian town. 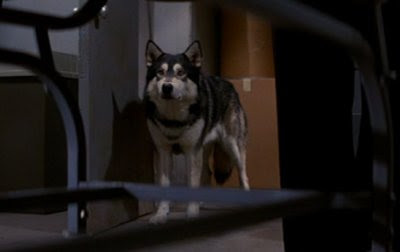 A shapeshifting alien disguised initially as a Husky causes a whole lot of deadly trouble for a team of Antarctic scientists. 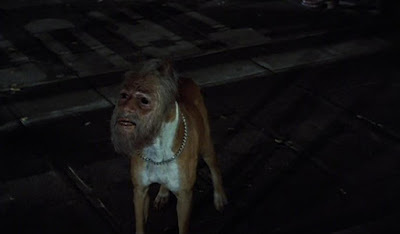 The human-faced Boxer dog in this sci-fi/horror is more frightening than it may seem, especially when you think about the implications of how it got to be that way. 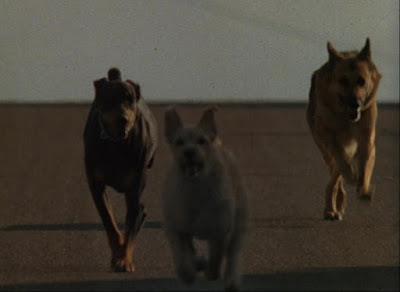 There's a really bad German Shepherd in Eli Roth's gruesome black comedy. Dr. Mambo menaces the students for some time before viciously attacking Marcy (Cerina Vincent). Remember, don't adopt a dog if you aren't going to look after it properly! Pets are for life, both yours and theirs.